Pool Enclosures and Fences | Boston Porch & Deck Co.
Boston Porch and Deck Co. is happy to offer pool enclosure railing installation to the North Shore and the Greater Boston area. Pools are enjoyable for the whole family during the summer but when it comes to safety, having a pool enclosure will ensure the safety of your children and your property. Having aluminum railings surrounding your pool are a great investment to your pool and will add value to your property when you are ready to sell your home. 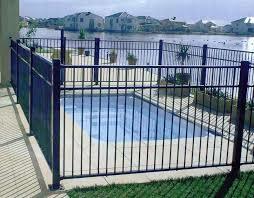 These aluminum railings will ensure no unwanted visitors enter your pool. Many homeowners should be aware that if any neighborhood child makes their way into your pool, the homeowner is liable for any injuries that may occur.